Contact: 719.302.1880 | Email Online tournament software by martial artists, for martial artists. TournamentTiger™ - Martial arts tournament software for hosting taekwondo, karate and other martial arts tournaments. TournamentTiger™ is online martial arts tournament management and bracketing software. Why use TournamentTiger™ to host your Martial Arts Tournaments? With each new day, you have an opportunity to assess and improve your business processes, and much like training in martial arts, there will always be something that you can improve upon. If you are still building brackets for your martial arts tournaments by hand or trying to use registration sites that were not designed for martial arts, then you owe it to yourself to find out how we can help. TournamentTiger™ is tournament software for martial artists, by martial artists. We take a genuine interest in your success and we will help you set up and run tournaments in any martial art. No tournament is too big or too small - TournamentTiger™ is highly configurable allowing you to pick and choose the features that work best for you. It is entirely online, so there is nothing to install, download, or upgrade so you can be sure you are always using the latest version. It will save you time and money and improve the participant experience, keeping them coming back year after year. But you don't have to take our word for it. Checkout some of the tournaments being hosted on TournamentTiger. Ask these tournament hosts how they have increased tournament participation, improved the competitor experience, and saved valuable time and money by using TournamentTiger™ to host their tournaments. 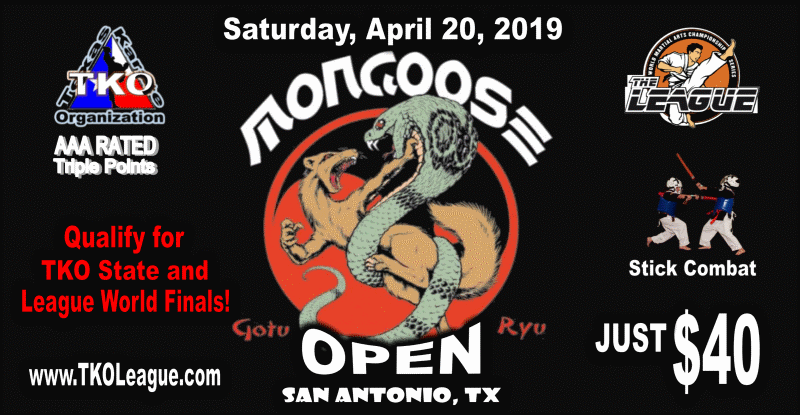 The Mongoose Open Karate Championship is a AAA (triple points) TKO rated tournament. Points earned at tournament will go toward TKO State Championship and The League World Championship. Start time 9:30 am SHARP! 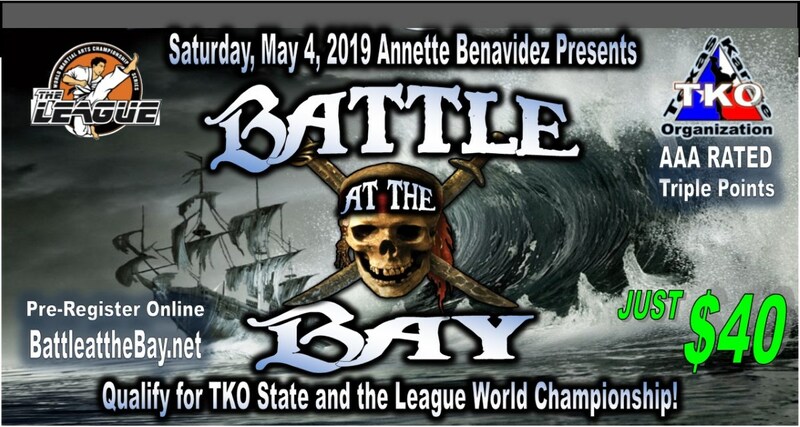 We are pleased to invite you to the Battle at the Bay TKO Karate Qualifier! We have established a rating system for tournaments and athletes, as well as judging parameters that will serve to elevate the standards and quality of Sport Karate. All competitors to be ranked and qualify for State Finals must attend a TKO Karate Qualifier! Tournaments that uses TKO rules and divisions will be considered a TKO “Qualifier”. There will be TKO regions throughout Texas. The players from each Region with the most points will earn top ranking at State Finals. THE MORE YOU COMPETE AND WIN AT A TKO QUALIFIERS, THE BETTER CHANCE YOU WILL RECEIVE THE #1 SEED AT STATE! ALL 1ST PLACE AT STATE RECEIVES THE CHAMPIONSHIP RING! The state tournament is open to anyone regardless of being a TKO member; however, all TKO members will be eligible to be seeded (placed in a preferred position of competition) at the state finals. Non-seeded competitors will be seeded as “Wild Card” players. The winner of the wild card players will then advance with the seeded players to compete for the state title. We will be using TKO rules at all TKO events . All competitors are required to check and send any corrections before the TKO State Finals deadline on our website. The season begins January and ends October of each year. A copy of the official TKO rules can be downloaded on our website. We look forward to another fantastic year and hope to see you real soon! Although the Hanmadang was initially established as a Taekwondo event, the majority of the events can be performed by any style martial artists. In order to provide an opportunity for all martial art schools and styles to participate, we have opened up the California State Hanmadang to everyone who practices traditional martial arts. 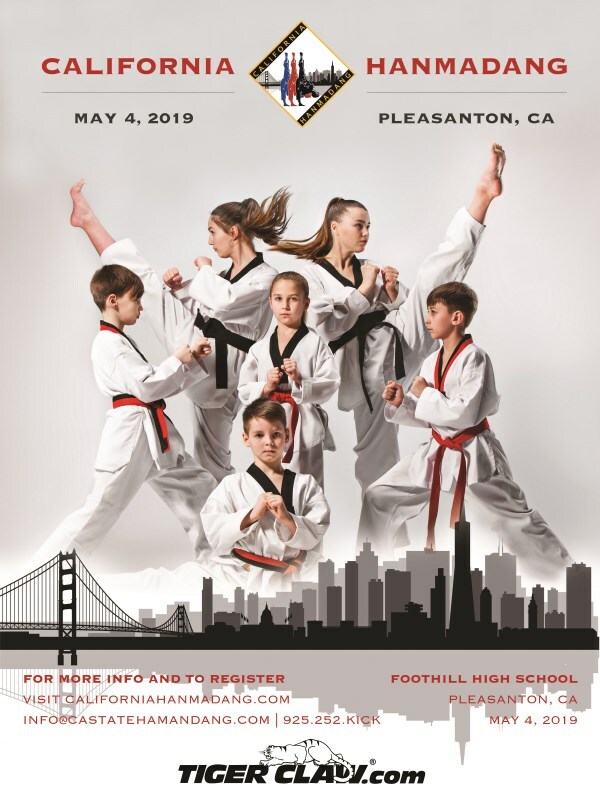 It is in this spirit that the California State Hanmadang provides a unique competition experience for all martial arts students. It gives the true majority of students a venue to test and showcase their skills in a plethora of events within Poomsae (forms), Kyukpa (breaking) and Demonstration Teams. 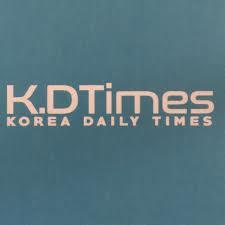 Taekwondo sparring is very well known as an Olympic sport. However, because of the high skill level and physical conditioning needed to be successful at sparring, the average Taekwondo School in the United States only has approximately 10% of the student body participating in sparring class and competitions. This usually also applies to the other martial arts as well. The California State Hanmadang events are for the other 90% of students who do not like to participate in sparring. The California State Hanmadang offers the opportunity for the 90% to showcase their skills in traditional forms, creative forms, creative board breaking, power breaking, and demonstration team events. The Official California State Hanmadang follows the guidelines, procedures and systems of the world renowned U.S. Open Taekwondo Hanmadang, which is hosted every year by the United States Taekwondo Committee in Colorado Springs, CO. You can be confident of an efficient, well organized and professional championship for an incredible competition experience! Congratulations in becoming part of history, as you will be participating in the very first state level Hanmadang in California! We are very proud to announce that all style participants will also be welcomed to participate at the 11th U.S. Open Hanmadang in Colorado Springs at the Broadmoor World Arena from July 25th-27th, 2019!!! We’ll see you at the California State Hanmadang! 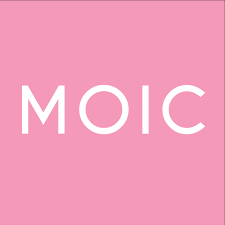 * Special gift ($30 Value) from the Museum of Ice Cream for the first 100 participants to register! MooDoTKD is excited to announce that we’ll be hosting the second annual Oregon State Taekwondo Hanmadang tournament, held right here in Eugene Oregon. • Part One: The Martial Art Expo on Friday, May 3rd at NW Ninja Park in Springfield. • Part Two: The Statewide Taekwondo Hanmadang Tournament on Saturday, May 4th at Venue 252. This is an officially sanctioned USTC event. The Hanmadang is an internationally sanctioned tournament that is a non-sparring, skill based competition. Events include forms, creative forms, combination board breaking, power breaking, speed spinning hook kick, high jump front and flying side kick for distance board break events and team competition. We will also be hosting an all styles open weapons tournament on Friday, May 3rd as part of the Hanmadang. Eligibility for enrollment: all belt levels/all ranks, ages 6+, anyone from any state can enroll in this tournament. The Hanmadang is an important evolution of the martial art tournament modality and practitioners truly get to exhibit, explore and compete in the full realm of their martial art training and skills. Seo’s Martial Arts Intramural tournament will be held in downtown Denver at the beautiful Colorado Convention Center. Registration Is Now Open! Register early and save. Are you a tournament host or tournament volunteer? 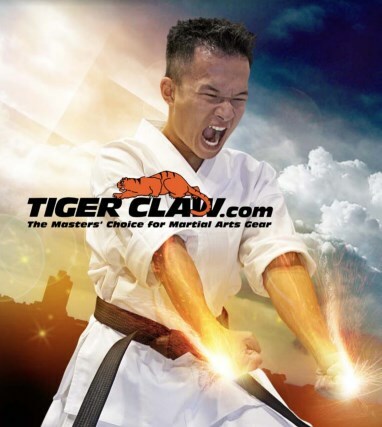 To sign in and manage your martial arts tournament, please visit us our TournamentTiger™ Application. Want to host your own martial arts tournament? Sign up! Are you looking to register as a participant in a martial arts tournament? To view a list of upcoming martial arts tournaments please visit our TournamentTiger™ Martial Arts Tournament Listings. Here are some feature highlights of TournamentTiger™. Definitely check out this software, it's awesome! Eric Hoffman is great, he's dedicated to helping tournament organizers and extremely helpful. Nothing does what TournamentTiger does, all in one package. It is the best software of its kind and the US Open Taekwondo Hanmadang would not be the success it is today without it. This is the best software system for organizing and running a martial arts tournament no matter the size... Thank you Eric for your help and contribution to the Martial Arts community! Any tournament using this software will be more professional by comparison. There is no more significant endorsement of TournamentTiger in my opinion. Have a question or want to suggest a new feature? We want to hear from you! Ask a question. TournamentTiger™ is tournament software for martial artists, by martial artists. In fact, we use TournamentTiger™ for our own martial arts tournaments! Managing your martial arts tournaments with TournamentTiger™ will save you time and money. We understand what is required to be successful hosting martial arts tournaments, and we maintain a genuine interest in your continued success. Register with us and we will help you set up and run tournaments in any martial art. Our registration, scoring and bracketing software is highly configurable allowing you to pick and choose the features that work best for you. It is online tournament software, so there is nothing to install, download, or upgrade. This means it is always up to date giving you access to the newest features and enhancements. If you are looking to make your next karate, taekwondo, or other martial arts tournament easier to manage, then TournamentTiger™ is a great place to start! © 2012-2019 Blueric Software, LLC Special thanks to the U.S. Taekwondo Center.